I was playing with this as a concept for a Lannister design, when much to my surprise I learned that Harry Potter’s Gryffindor House also uses a lion for its logo. I figured, y’know, it would be a Griffin. Learn something new everyday. 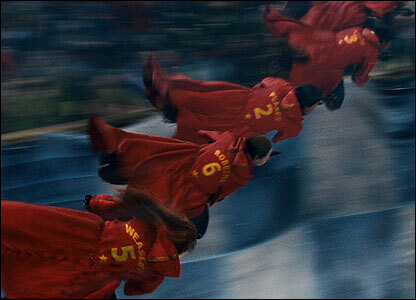 The actual Quidditch uniform doesn’t have a large front logo crest or any names and numbers (that I can tell), it looks rather rugby-ish. Still it would look decent making the jump to hockey. This design also reminds me of the Calgary Flames’ Heritage Classic uniforms from a year ago, which are nearly identical save for an additional gold stripe on each arm and a lace collar. The design is still a work-in-progress, as I haven’t had much time to post anything, so I thought it would be fun to throw together. UPDATE: Here is a variant. Thanks to Scott for the heads up about the star patch! 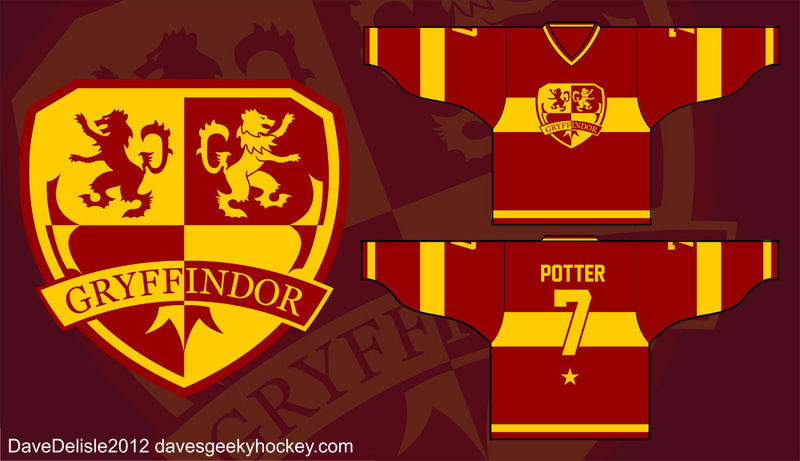 Posted on February 4, 2012, in Hockey Jersey Design and tagged calgary flames, Geeky Hockey Jerseys, gryffindor house, Hockey Jersey Design. Bookmark the permalink. 18 Comments. I love it, Dave! Keep going with this idea! I think Jerseys for the four houses would be fantastic! Also, how about some for LOTR? Gondor, Rohan, Mordor, etc.? Or for Star Wars? Imperials, Rebels, Bounty Hunters, Smugglers, Rogues, etc.? I’d definitely throw in the laces, laces class up any jersey. I love laces too, but wanted to emulate the shirt seen in the films, which had a rounded collar. A v-neck was as close as I can get. I would soooo get this with Weasley on the back!!! If there was a Ravenclaw one, I would so get one. A+ work. Great site Dave, love the designs. About the names and numbers, in the film they are very much based on football shirts here in the UK so not much use on a jersey, however there is also a star placed on the lower back of each player if you wanted to get technical. I just want a chance to buy one, so lets make this happen! We’ll see. I’ll have to use some artistic tomfoolery methinks to make this happen! I just don’t want to draw the wrath of Warner Brothers. They have Batman on their side. I am always annoyed at how 75% of Hogwarts house items that can be bought are Gryffindor and the other 25% are Sytherin. I have seen a tiny smattering of Ravenclaw items and no Hufflepuff whatsoever. These two houses deserve some love, and I think it would be fantastic if you could make jerseys for all 4. Let me just say you are awesome for doing this. All of your designs are fantastic and with a little luck you’ll still be doing this when I’m not broke. The geek world thanks you. How do I get one of these?! Please start manufacturing and selling them! Two words: Youth Sizes! Pleeeeaaasse! The smallest youth size was only 10% smaller than the Adult Extra Small, so it’s not a huge removal in the scheme of things. Sorry! Thanks for explaining. I read in your earlier post that you were dropping youth sizes. If the adult xs is really that small, I am totally in for a pair of gryffindor xs’s. Keep up the good work.